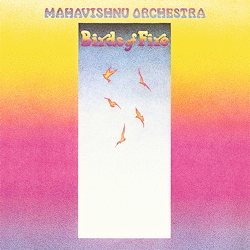 ﻿Of the three 'incarnations' by the spiritually inspired Mahavishnu Orchestra, the first is the most full-bodied. The enlightened John McLaughlin and his musicians were immortalized through their début album "The Inner Mounting Flame", which was included in the list of the 100 Best Jazz Albums; a short time later they recorded their highly concentrated studio compilation "Birds Of Fire". Long before today’s saleably labelled World Music, the quintet set the standards for a meaningful amalgamation of dynamic rock with complex Indian rhythms and occidental conventions. Already in the title piece, the musicians combine a sharpened Hendrix style with expansive melodies, and with smacking grooves and fine riffs draw all that is grand in jazz ("Miles Beyond") into the musical centre. With almost chamber-music-like density, "Thousand Island Park" blossoms out in soft colours, whilst as a contrast unremittingly flowing cascades in "Hope" search desperately for their destination. It is thrilling how finely weighed patterns ("One Word") escalate to techno-like violin playing and how the listener is invited to take part in an inner procession in the following "Sanctuary". After such soaring heights, we are brought back to earth with a familiar funky sound in a popular, pastoral vein ("Open Country Joy") before taking off abruptly once again: in the final piece, "Resolution" with its slowly rising carpets of sound, all that is sublime in New Music conquers over world cultures.